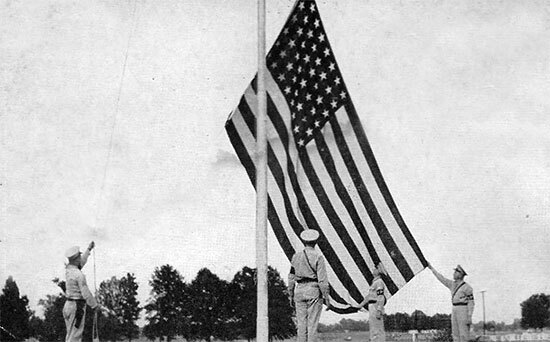 MPs hoist the “Stars and Stripes” above Camp McCain (Elliot,Mississippi; birthplace of the 623d Medical Clearing Company) during the summer of 1942. The 623d Medical Clearing Company (Separate) was officially activated in the early part of 1943 at Camp McCain, Elliott, Mississippi (Infantry Division Camp; total acreage 42,243; troop capacity 2,779 Officers and 39,341 Enlisted Men. Later used as a PW camp for German prisoners –ed). The unit was comprised of a Headquarters and two Clearing Platoons, with each Platoon having approximately 50 personnel. Training was begun immediately, and the unit’s personnel joined many other organizations as part of the Tennessee Maneuvers during the summer of 1943. Additional training was conducted at Camp McCain after the Maneuvers had been completed. All Technicians assigned to the unit were required to complete at least 165 hours of lectures. Additionally, each Enlisted Man was given a one-month temporary duty assignment to Billings General Hospital, Fort Benjamin Harrison, Indianapolis, Indiana (Finance Replacement Training Center –ed). Upon completion of all required training, the 623d Med Clr Co was transferred to Camp Forrest, Tullahoma, Tennessee (Infantry Division Camp; total acreage 73,124; troop capacity 1,886 Officers and 32,368 Enlisted Men –ed), where final preparations for movement overseas were conducted. Cpl. John Wood stands in front of one of many hutments at Fort Benjamin Harrison during a training exercise in the Zone of Interior. The 623d left Camp Forrest by train for Camp Shanks, Orangeburg, New York (Staging Area for New York Port of Embarkation; total acreage 2,009; troop capacity 2,545 Officers and 46,367 Enlisted Men –ed) on 9 April 1944, and was then transferred to the New York Port of Embarkation. Upon arrival at the port, all personnel and equipment were loaded aboard the USS “Exceller” (commercial steam ship drafted by the US Navy in 1942 for transports across the Atlantic –ed) during the afternoon of 23 April. The transport left Staten Island the following day for a 13-day trip across the Atlantic. The destination was to be the United Kingdom. USS “Exceller” arrived in the dock of Glasgow, Scotland early in the morning of 6 May 1944, and debarkation began immediately. After all personnel had debarked, the unit boarded a train for Wolverhampton, arriving at approximately 0200 the following morning. Upon arrival into Wolverhampton train station, a short march was taken to the nearby estate of Wightwick Manor where the unit was to be billeted inside Quonset huts in the grounds of the large English estate. Time was largely spent in finalizing unit organization, and daily calisthenics were introduced to keep the men occupied until further orders were received. 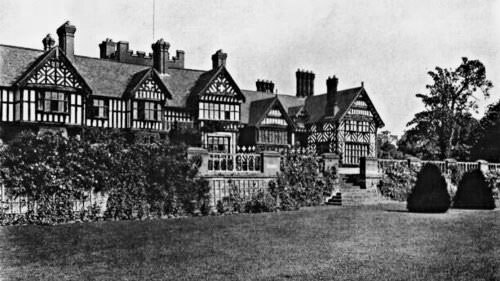 Photograph showing the main manor house on the Wightwick Estate; the 623d’s first home in the United Kingdom. On 5 July 1944, the unit left Wolverhampton for Dursley, Gloucestershire via train, arriving at approximately 1500 the same date. During the stay at Dursley, the unit’s personnel were billeted in tents in the grounds of the Dursley Secondary School. This move, it transpired, was in readiness for crossing the English Channel into France, and thus final preparations were made and checks of all unit equipment were carried out to ensure the organization was fully ready for the task ahead. On 11 July 1944 all personnel of the 623d departed Dursley by train for the marshaling area near Southampton, where once again they were billeted in pyramidal tents awaiting further instructions and embarkation details. Five (5) days were spent in the marshaling area, and finally on 17 July, the unit left for the port of Southampton, boarding the steamer “Crossbow” at 1300 hours the same date. Shortly thereafter, the vessel left her berth at Southampton and all unit members were informed of their destination; Omaha Beach, Normandy. The outfit was due to arrive later that evening, but due to heavy fog, its transport spent the night anchored in the English Channel. The trip was resumed at 0400 on 18 July 1944. After debarking from the large steamer into smaller LCAs (British Navy Landing Craft Assault –ed), the unit finally landed on Omaha Beach at 1800 on 18 July 1944. After debarking from the landing craft, a 7-mile hike (complete with all individual equipment and packs) was conducted to Transient Camp “B” (arriving at approximately 2145 hours) where the personnel spent their first night in France. The following morning, the unit left the camp for Barneville-Carteret. Upon arrival, orders were received for First Platoon (consisting of 4 Officers and 36 Enlisted Men) to leave the balance of the unit, and travel to Sainte-Mère-Église. Upon arrival, the Platoon was instructed to operate a neuropsychiatric ward in conjunction with the 614th Medical Clearing Company which was also stationed in the vicinity. Exterior view of one of the buildings used by the 623d Med Clr Co and the 108th Evacuation Hospital in Rennes, France. Photograph taken August 1944. The stay at Barneville-Carteret was a short one, and Headquarters and Second Platoon left the area on 2 August, arriving at Saint-Sauveur-le-Vicomte the same day. The main reason for the move was to hold the unit in reserve while the front line was moving south east past Saint-Lô. The personnel were stationed in shelter tents during this period for a total of six days. On the afternoon of 8 August, First Platoon rejoined the 623d, and the unit moved to Granville and was once again placed in reserve. The stay at Granville was similarly short, however, and after five days the unit once again departed, this time for Rennes, arriving at 1300 on 13 August 1944. Immediately upon arrival in Rennes, the 623d operated a small holding station for the 108th Evacuation Hospital (stationed at the racetrack outside of the city –ed) and received its first patients the same night. In order for the Company to operate in accordance with its mission to provide third echelon care to patients, one Surgical Team from the 52d General Hospital was attached to it for temporary duties. 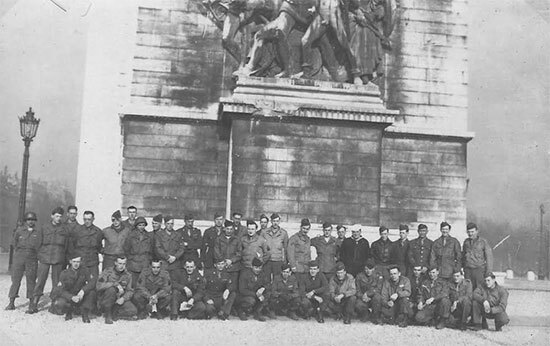 Group photograph showing personnel of the 623d Medical Clearing Company during a visit to Paris. Photograph taken March 1945. The unit departed Rennes during the early morning of 19 August to establish and operate a holding station for the 101st Evacuation Hospital at Le Mans. The facility was operated for 2 weeks by the unit, and on 2 September 1944 the men began their journey back to the Brest peninsula. After an overnight stay in Rennes, the Company continued to Lesneven, arriving at 0300 hours on 3 September. A small bivouac of shelter tens was immediately established for the night, and the following afternoon, the personnel were once again on the move. This time, a 25 mile journey to the northeast of Brest was undertaken, where the unit’s Headquarters and Second Platoon worked alongside the 100th Evacuation Hospital. During this period, the unit processed many German prisoners of war; those who were fit were sent to a nearby Allied PW Camp, while those needing medical treatment first received immediate first aid before being transferred to a German military hospital (supervised by Allied medical personnel), also in the local area. The 623d continued to operate with the 100th Evacuation Hospital for approximately two weeks and on 28 September 1944, the organization left the Brest peninsula in ambulances for Belgium. Several overnight stops were made en route; first at Mayenne, France; then Rambouillet, France and finally on to Saint-Quentin, France. The final overnight bivouac was spent in shelter tents near the town of Houffalize, Belgium. The 623d Medical Clearing Company (less First Platoon) arrived 11 miles north of Bastogne, Belgium on 2 October 1944, where it remained for two weeks. 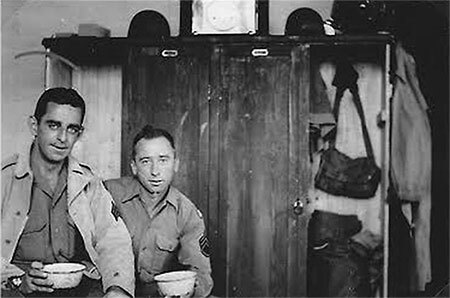 All personnel of the unit were stationed in shelter tents, and during this period enjoyed the World Series games, which had been broadcast by the Special Services. The task at hand was to assist the 102d Evacuation Hospital in its duty to establish a 500-bed facility in the Château de Roumont (3 miles from the village of Libin –ed). The works were completed a week later, and thus the 623d was once again on the move, this time to Luxembourg. Ambulances and other US Army vehicles pictured in front of the 110th Evacuation Hospital’s facility in Esch-sur-Alzette, Luxembourg. During this period, the 623d Medical Clearing Company acted as a small holding station for the overflow of patients from the main hospital. 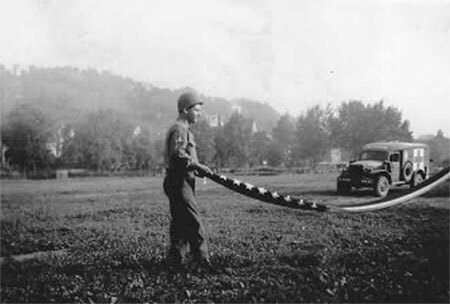 On 10 October 1944, Headquarters and Second Platoon moved north of Esch-sur-Alzette, Luxembourg (12 miles south of Luxembourg city –ed), and immediately established a small station in a field located near to the 110th Evacuation Hospital. It had been raining almost continuously and there was mud everywhere. The 623d acted as a holding station caring for patients that the 110th Evac Hosp could not handle. The facility remained in operation for one week, in a sea of mud, and then moved approximately two miles to a former school building and pre-war German-operated maternity hospital at Schifflange, Luxembourg. At the same time, the 110th Evac Hosp moved into a building at Esch, about three miles from the 623d bivouac area. The two units worked together at the Hospital facility during the winter months, receiving many severely injured and frostbitten patients from the frontline during the Battle of the Bulge. Admissions peaked at just over 300 per day during the most intense period of the Battle of the Bulge, with the joint team of the 110th Evac Hosp and 623d Med Clr Co treating over 5,000 patients in January 1945 alone. Despite the high patient census and workload, the mortality rate among the 2,200 surgical cases was only 1.5%. 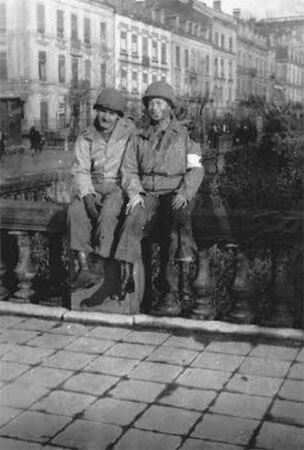 John Wood and Sam Ruben pictured during the unit’s time in Luxembourg City, Luxembourg. 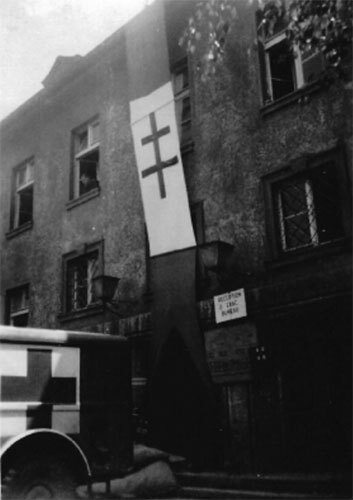 After the 110th Evac left the area on 18 February 1945, the 623d Med Clr Co started a small hospital in the same building for patients with self-inflicted wounds. Before each patient could be discharged from the hospital, he had to undergo a formal hearing before a review board as to how and why he was injured. It was during this period that the First Platoon rejoined the balance of the unit for a short period of rest and recuperation. By 28 February, all cases had been reviewed, and no new admissions were made to the facility. 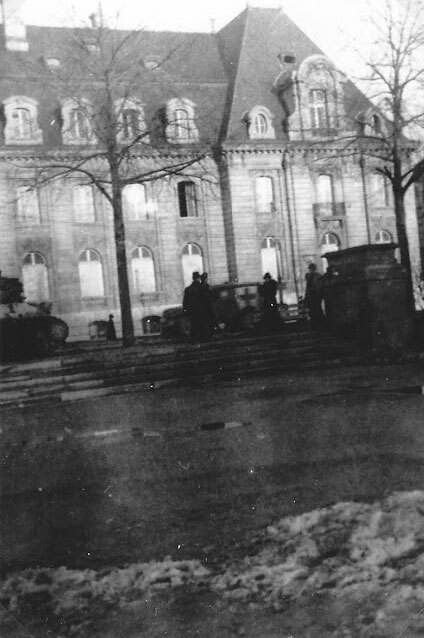 As a result, the 623d (less First Platoon) moved to Mondorf-les-Bains, Luxembourg where it operated a small convalescent hospital in a local hotel. The hotel was in a good state of repair, and was also used as billets for the unit’s personnel. On 28 March 1945, the 623d Medical Clearing Company (Separate) entered Germany, and bivouacked at Gonsenheim, a suburb of Mainz on the Rhine river until further orders were received. On 3 April, the unit crossed the Rhine at Mainz on a pontoon bridge and began processing injured personnel from numerous German Army hospitals in the area. It was at this time that Second Platoon rejoined the balance of the unit. By 16 April, the 623d was at Gera (approximately 60 miles east of Gotha), where it worked at two camps for Allied Prisoners of War for seven days. Cpl. John Wood folds the American flag for the first time on German soil. A Dodge ambulance (assigned to the 623d Med Clr Co) is is clearly visible in the background. Photograph taken on 1 June 1945. On 3 May, Second Platoon moved to Pilsting, a small town on the Germany / Austria border, during which period some of the personnel went into Austria to treat recovered Allied PWs (RAMPs), returning to the main body of the unit at Pilsting on 6 May. During the evening of 7 May, the news that V-E Day (Victory in Europe Day –ed) would arrive in the morning finally broke, much to the excitement of everyone! With the war officially over, the unit moved to a former maternity hospital at Gmunden, Austria at the foothills of the Alps and near to a beautiful lake. After an overnight stay in this location, the 623d moved once again to Wels. The unit was billeted in pyramidal tents, which had been sourced from a local Engineer unit, and worked at the political prison near Wels. By 15 May, all work had been completed at the prison, and the unit left the location by ambulance and returned to Germany, establishing a temporary bivouac in Geiselhöring. After a short rest period, the tented bivouac was struck, and all personnel entered the buildings on the opposite side of the road. The buildings formed part of a larger complex, which had been used, in the early part of the war to train young German boys to become part of the Hitler Youth. Sgt. James Mooney and S/Sgt. Harry Parker pose for the camera in their barracks in a former Hitler Youth training facility at Geiselhöring. In early July 1945, after a total of 16 months overseas, the 623d Medical Clearing Company (Separate) was officially deactivated. All members were either transferred to other units operating in the area, or those having sufficient high ASR scores were returned to the United States for discharge. Studio portrait of Corporal John A. 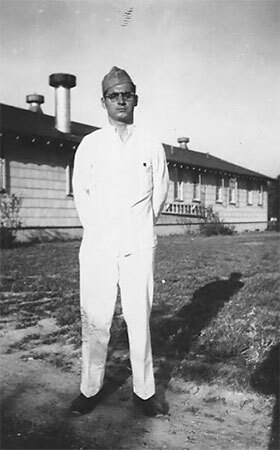 Wood, Jr. (ASN:37404670), who served with the 623d Medical Clearing Company during WW2. The MRC staff are forever indebted to Christine Smith, daughter of Corporal John A. 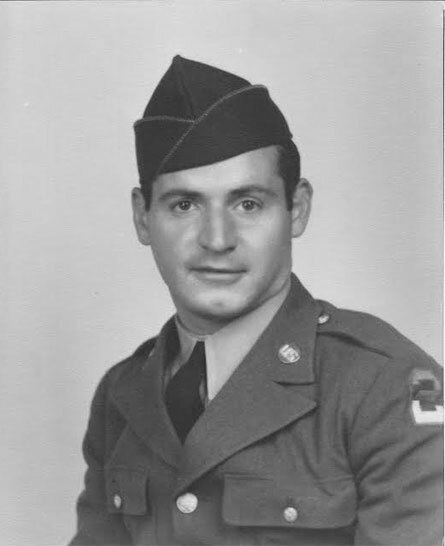 Wood, Jr. (ASN:37404670) who served with the 623d Medical Clearing Company (Separate) during WW2. Christine was able to provide many original documents and photographs that allowed us to edit this concise Unit History for which we are most grateful indeed. We are still looking for more specific information about the unit’s official deactivation date, and also a complete Personnel Roster. If you are able to help, please do not hesitate to contact us.